Solzhenitsyn apartment-museum at 12 Tverskaya street, apt. 169 in Moscow. The Solzhenitsyn "Apartment-Museum" opened on 24 December in Moscow in the presence of the author’s widow, Natalia Solzhenitsyn, and their sons Yemolai and Stepan. Russian-language news stories here, here and here; news videos below. On 19 December, a new monument to Solzhenitsyn, authored by renowned sculptor Zurab Tsereteli, was unveiled in Kislovodsk, the city of his birth, by the Speaker of the Federation Council Valentina Matviyenko. News report from rg.ru (in Russian), and video clips below. 11 December 2018. 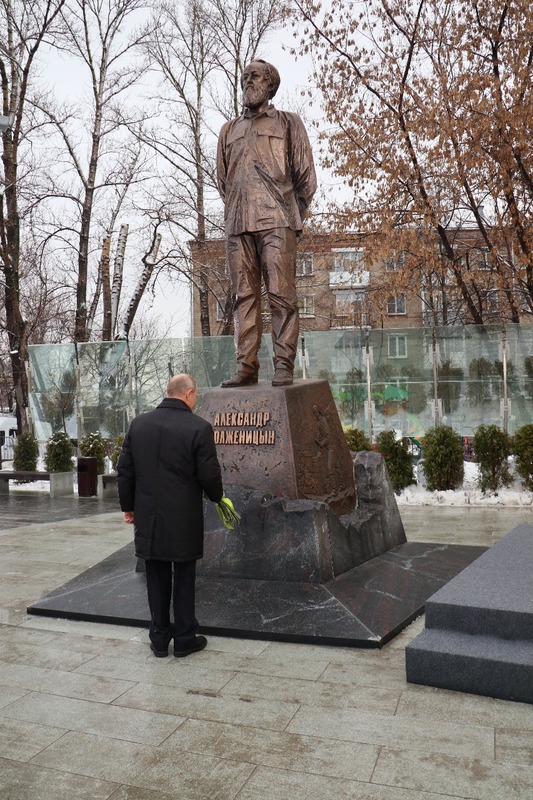 Russian President Vladimir Putin lays flowers at the new Moscow monument to Solzhenitsyn. The 2013-14 Pushkin Museum Solzhenitsyn exhibit, Александр Солженицын: Из-под глыб (Aleksandr Solzhenitsyn: From Under the Rubble) is now viewable online, complete with full exhibit catalog and VR (virtual reality) tour, in time for Solzhenitsyn@100 celebrations. This is the most comprehensive Solzhenitsyn exhibit yet mounted, containing many important manuscripts, documents, photographs, and personal objects. This exhibition, marking the centenary of Aleksandr Solzhenitsyn’s birth, coincides with the launch of the Solzhenitsyn Initiative by the Notre Dame Center for Ethics and Culture as well as the publication of the first English translation of several of Solzhenitsyn’s works by the University of Notre Dame Press. Through 14 December. An international conference is opening at Northern Vermont University to mark the centennial of Solzhenitsyn. The Associated Press has more details. The Cavendish Historical Society Museum hosts an exhibit on Aleksandr Solzhenitsyn, which will become a permanent exhibit. 2018 marks the 100th anniversary of Solzhenitsyn's birth; in commemoration of this, the State of Vermont issued a proclamation in his name, observing the author's life work, which included living and writing in exile from the Soviet Union / Russia, in Cavendish. Margo Caulfield from the Historical Society gives us the summary of Solzhenitsyn's life & work, as portrayed through the museum's exhibit. She also discusses the children's book she authored about Solzhenitsyn. The Vermont History Museum is showing a new exhibit about Solzhenitsyn’s years in Vermont. Until 22 October. The opening of a new exhibition, "Solzhenitsyn at 100: Celebrating the Life and Work of Aleksandr Solzhenitsyn in Honor of his 100th Birthday", will take place on Saturday, May 19th at the Vermont Historical Society Museum in Montpelier. The exhibit, which will run through the summer, outlines the writer's life with a focus on the twenty years that he and his family called Vermont home (1975-1994). Prior to the exhibit's official opening, on Thursday, May 17th, University of Vermont Professor Kevin J. McKenna will be the guest speaker at a luncheon hosted by the museum. His talk is entitled, "No Man Is a Prophet in His Own Land’: Russia’s Loss Has Been Vermont’s Gain.” McKenna will present a general introduction to Solzhenitsyn and his life in Cavendish, as well as what his presence in Vermont meant for Vermonters. This is the Vermont History Museum's "Third Thursday Talk" for May. The presentation will begin at 12:00pm; coffee & water will be provided. Organizers welcome attendees to bring lunch to eat while listening. Attendees will have a chance to view the Solzhenitsyn exhibit, which officially opens Saturday, May 19th. The Union of Moscow Architects has unveiled an exhibit of the various projects competing to be awarded the right to build a major monument to Solzhenitsyn in Moscow. The winner will be announced on 7th December. As reported by Digital Journal, The Solzhenitsyn Foundation and the Memorial organization have partnered in backing the creation of a new monument by sculptor Georgy Frangulyan, which was unveiled as a part of a memorial for Soviet-era victims of political repression in Central Moscow. Russian President Vladimir Putin spoke at the memorial's dedication and quoted Natalia Solzhenitsyn in his remarks. Located in Rostov-on-Don, the Southern Federal University (SFU) has announced plans to create a virtual museum about the author in hopes of inspiring current students. The author graduated from Rostov University and went on to teach at a school in Morozovka for a short time before he began his service in WWII. There will also be a monument in his honor. As covered by the Russkiy Mir Foundation, a cultural center named in honor of Aleksandr Solzhenitsyn opened recently in Paris. Solzhenitsyn scholar George Nivat is a member of the center's steering committee. The first exhibit, "The Gulag Archipelago, History of Literary Breakthrough", highlights historical photos and artifacts from the novel's development, which Solzhenitsyn wrote while in hiding in Estonia in 1967. A monument dedicated to Solzhenitsyn's will be raised on Ulitsa Solzhenitsyna, the Moscow street named in the author's honor. It was also announced that a potential museum dedicated to Solzhenitsyn is also in development; a location on Tverskaya ulitsa, a major throughfare in Moscow on which the author lived with his wife and young boys, has been considered. The Russian A. I. Solzhenitsyn Museum and Informational Cultural Center opened on May 31 in Kislovodsk. Solzhenitsyn’s birthplace, Kislovodsk, is a spa town on the north slope of the Caucasus Mountains, and near the steppes (prairies) of southern Russia. Solzhenitsyn’s grandparents farmed in this region. Although the home where he was born and the church where he was baptized were both destroyed, the home that once belonged to his aunt, Maria Gorina, and where he lived as a toddler, remains. The State Literature Museum restored the home so that it could serve as the site of the new museum. In 1956, having been freed from exile in Kazakhstan, Aleksandr Solzhenitsyn took a teaching position at a school in the village of Mezinovka. He rented a room from Matryona Vasilyevna, who would go on to be the inspiration for his novella Matryona's Home, which he wrote that year. A memorial to the writer and a reconstruction of Matryona's home were unveiled last week in Mezinovka.